The sound clip provided on this page is a Real Audio .rm file. This clip will play immediately, yet can only be heard if one has installed a RealAudio program, such as Realplayer 5.0. To download a free copy refer to the link at the bottom of this page. Please bear in mind that these recordings were made many years ago when taperecorders had just appeared on the market. As Leslie Flint's house was situated at a thoroughfare street noises often penetrated into the seance room. The voice of Sir Oliver manifested at a point in space in the seance room not far from the medium and the sitters. 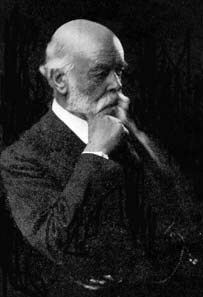 In 1963 a voice manifested in the seance-room of British medium Leslie Flint which claimed to be that of the late Sir Oliver Lodge (1851 - 1940). The British scientist and Fellow Royal Society is known as a pioneer in the field of radio communication. He was also deeply interested in paranormal phenomena. After he lost his son Raymond during WW1 he was convinced to have established contact with him through a medium. He was also a President of the Society for Psychical Research. A direct voice purportedly of Sir Oliver manifested a few times in space at the seance room of Leslie Flint. At one occasion he gave an explanation of the spacial voice. "There must be many in, your world who are curious as to how it is that we, who are so-called dead, can communicate with you in a vocal manner, to be able to assimulate, if only for a brief moment of your time, our personalities, our speech, to be able to give to you some identity of individual personality and character, and in some instances known to you, by relationship, or by some link of the past....."
"...To hold a long conversation, to be able to transmit thoughts clearly, distinctly, as sounds to you, so that you may know what we are endeavouring to put over is in itself a task which involves many people on this side, indeed, a whole group. There are those whose task it is to construct as best as they can a replica of the vocal organs necessary for speech, from the ectoplasm, which is the substance drawn from the medium chiefly. This substance, which is a life-giving force, by which we are able to communicate with you." For more communications see here. The mode of future existence. 1933 Lecture by O.L.